The weather is warming up, and you are ready to get outside and light up the grill. You have stocked up on the best charcoal, but where should you store it? When it comes to charcoal, water is its worst enemy. Charcoal needs to be kept cool, dry, and well away from any source of moisture. This includes fog, rain, or humidity. 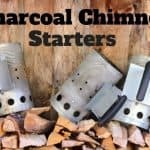 Let’s take a look at some of the best charcoal storage containers and bins and learn how to store charcoal. Produced by one of the most trusted names in charcoal, the Kingsford Charcoal Dispenser is one of the best charcoal storage containers you can get. This rainproof container will keep your charcoal fresh, dry, and ready to dispense from its flip-top lid. This container is perfect for storing lump or briquette charcoal. The handle makes pouring easy, but you can also purchase a scoop separately for convenient distribution of the coals. The container itself is a hard plastic, which is not as durable as some other containers. Store this container indoors and do not leave it outside to weather the elements, as this can make the plastic brittle and prone to cracking. 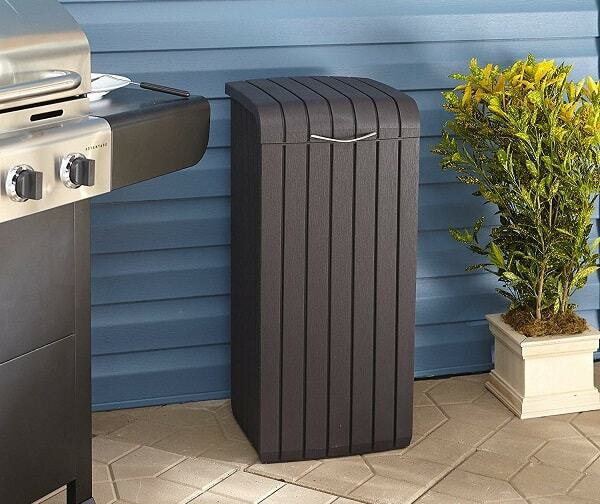 With high capacity and a great price, the Keter Copenhagen 30-Gallon Outdoor Charcoal Bin is a real winner. While its attractive wood design lends itself well to being an indoor/outdoor trash bin, it also makes an excellent charcoal bin. 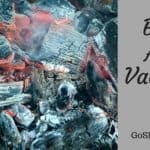 You can store enough charcoal at one time for plenty of summer barbecues! Durable and built to last, all you need to complete this charcoal bin is a quality scoop. The sleek metal handle gives easy access to the weather-resistant bin. You can store your charcoal inside a large size trash bag, and the removable rim of this bin will ensure that the bag never slips. If you are looking for a storage container that is great for pellets or a small amount of charcoal, look no further than the Traeger Grills Storage Bucket. There is a 20 pound capacity for charcoal pellets. The Traegar includes a tight sealing lid and a strainer. It is made from galvanized steel and is easy to carry using the wooden handle grip. 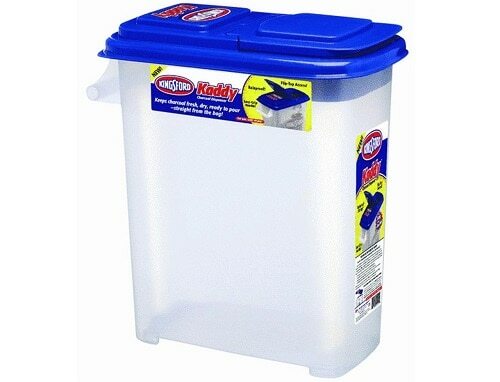 It is recommended that you store this bucket someplace waterproof to prevent rusting. If you’re looking for the best charcoal storage containers, you won’t go far wrong with this one. 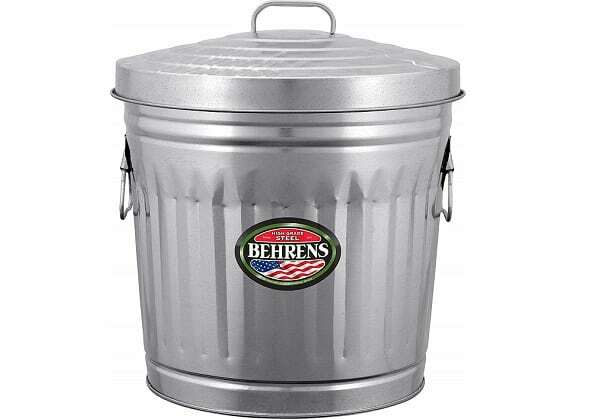 It may seem like a no-brainer, but metal trash cans make the perfect charcoal storage containers. They are rust, fire, and heat resistant. Plus, they come in a variety of sizes and are typically very inexpensive! 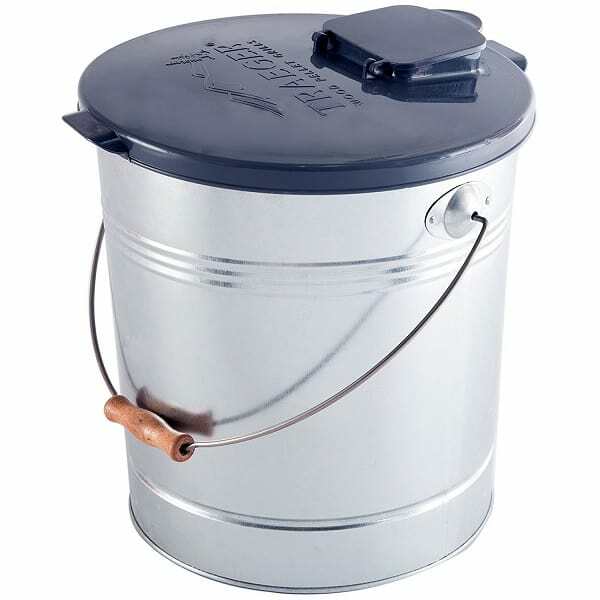 A ten-gallon metal trash can hold about 12 pounds of lump charcoal. There is one thing to be aware of though if you plan to use a metal trash can as a charcoal storage bin. While the lid is pretty snug, that does not mean it is airtight. Humidity can still find its way inside. To prevent moisture from reaching your charcoal, we suggest lining the trash can with large, heavy-duty trash bag before adding your charcoal. Let’s say you are the kind of person that likes to stock up on charcoal whenever your favorite brand is on sale. 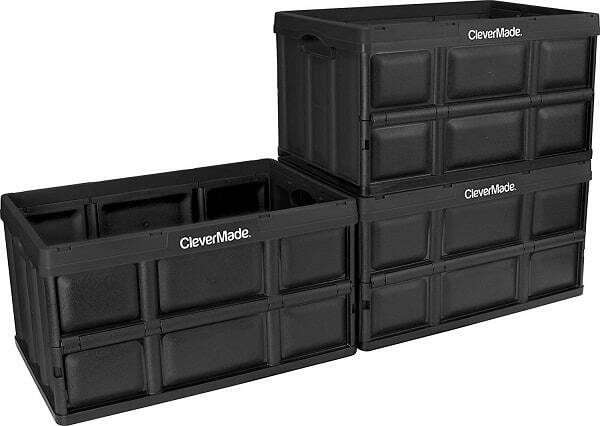 You are going to need convenient and stackable charcoal storage. 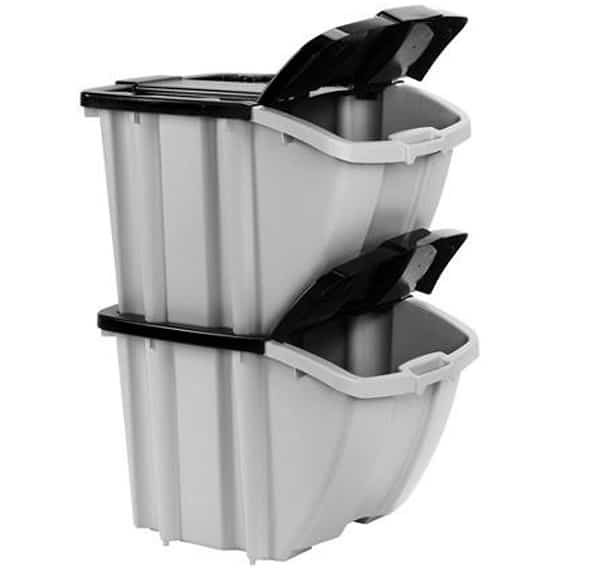 If you have the space in your garage or on a covered deck, these stackable bins can hold up to 66 pounds per bin. They have comfortable handles for heavy lifting and are easy to clean. The best part is that, when grilling season is over, these bins easily collapse flat to less than three inches thick. So even your storage is easy to store! Again, this is another style of container that does not have a tight fitting lid. You will need to take precautions to ensure that your charcoal is kept safely away from invading moisture. Consider keeping these bins stacked inside an enclosed area. If you consider grilling and smoking your hobbies, chances are you keep plenty of different kinds of fuels on hand. Whether you are looking to store lump charcoal, briquettes, or wood chunks, stacking recycling bins are a great way of separating and storing fuels. The hinged lids provide easy access to your briquettes and other fuels, and the containers have an eighteen-gallon capacity each. When it comes to storage, these bins are a great space saver. Stack them in your garage, or another cool and dry location. Another way to store mass quantities of fuel and still keep it portable is to use a wheelie bin. These extra large trash bins have a capacity of 32-65 gallons and the heavy duty wheels make mobility easy. Even with a heavy load of fuel, you can expect your charcoal to remain secure during transport. The rollout lids open fully and can remain open unassisted. However, they are not airtight, and thus you should take extra precautions to ensure that your fuel is stored in an area free from moisture and humidity. 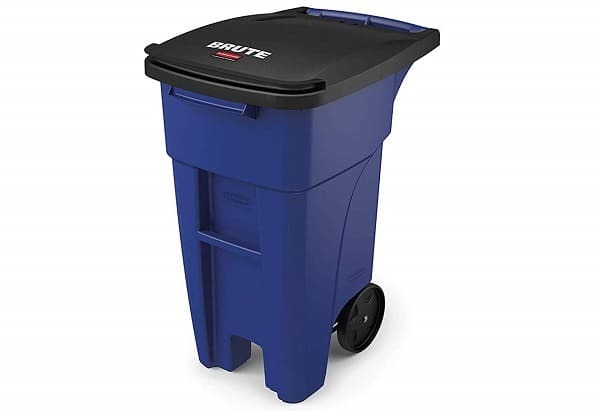 The rim and lid do exhibit much more structural stability than other comparable trash bins, and the rear handle makes pushing or pulling a heavy load effortless. 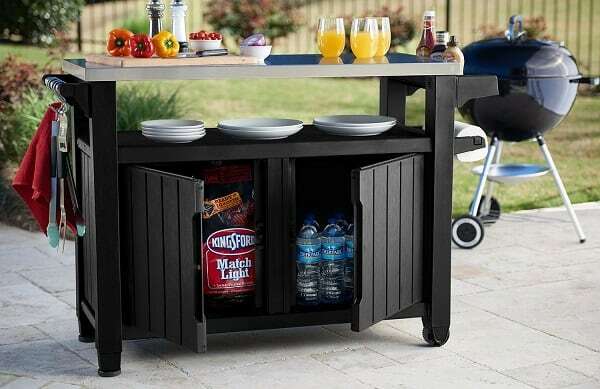 Combining functionality with a sleek design, a Keter Prep Table with Charcoal Storage will meet your every need for grilling prep. 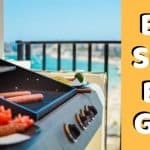 It is a stand out among other BBQ Tables. It offers efficient mobility with two wheels and adjustable legs. There is also the additional benefits of a stainless steel prep surface, hooks for your utensils, a spice rack, and even a paper towel holder. But how does it rate in terms of charcoal storage? The bottom compartment has a 78-gallon storage capacity which is sealed and lockable. Built from all-weather polypropylene resin plastic, the cabinet is sturdy but not airtight. Consider keeping your charcoal or other fuels in smaller, airtight containers within the locking compartment. While we tend to prefer storage bins and containers that are completely weatherproof, this prep table and storage cabinet can’t be ignored. It is solidly built, and its multiple functions make it a really cost-effective option. No matter what kind of charcoal you plan to use, its biggest enemy is any form of moisture. That does not just mean rain! Leaving your charcoal outside and unprotected will expose it to humidity, fog, and dew. This can make it nearly impossible to ignite. Most of the commercial charcoal available on the market today is a byproduct of wood and kindling. If you have ever tried to start a campfire, you already know that the kindling you have to use must be dry. The same goes for your charcoal. We have said it before, and we will say it again – water and charcoal DO NOT mix! Charcoal should always be stored in a cool, dry location and as far away as possible from any source of moisture. Otherwise, you might find that your charcoal supply will no longer ignite. It is possible to salvage wet charcoal, depending on the type you are using and how much moisture it has been exposed to. Briquettes have a tendency to disintegrate when exposed to moisture. If they crumble when you pick them up, cut your losses and buy a new bag. Wet lump charcoal and briquettes that are still solid can be dried in the sun for a couple of days. Lay them out in a single layer and flip them over between days. You want to make sure they are completely dry to the core, otherwise they will take longer to light. If you plan to use charcoal that has gotten wet and then dried, the best thing to do is to use fresh charcoal as a starter. Put the fresh fuel on the bottom of the chimney, and then layer in the wet-to-dry charcoal on top. This will make igniting the charcoal easier. After every use, roll the top of your bag down to securely seal the bag. Once sealed, store it in a cool, dry, well-ventilated location away from any source of heat or moisture. For instance, in any of the storage bins or containers that we mentioned above. Some commercial charcoal briquettes are treated with lighter fluid to help them ignite faster. So if your bag of charcoal is outside at the mercy of the elements, the solvent will eventually evaporate. This makes lighting the charcoal much more difficult, not to mention the risk of exposure to moisture. The best charcoal storage containers will allow lump charcoal to last indefinitely. 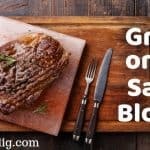 As long as it has been kept in a cool, dry place well away from any moisture or humidity, you can expect your charcoal to last years and years. Scientists have even discovered charcoal made from compressed plant matter that burned over 400 years ago and would still burn today. Briquettes with added lighter fluid, on the other hand, have a shelf life of around one to two years. If your bag has remained open or become torn, the chemical additives will evaporate much quicker. This is why it is so important that, when storing the charcoal, it is inside an airtight container. 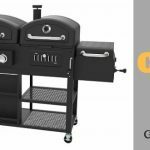 When finding a place to store your charcoal or new charcoal storage bin, there are a few important factors to keep in mind. First, you should try to choose a spot that isn’t in direct sunlight. You should find someplace cool and dry. Ideally, a garage or basement that is naturally dry would be a great place for this. If the basement or garage is not naturally dry, you could use a dehumidifier to help pull the moisture out of the air. If storing outdoors or in an outdoor shed, try to keep your charcoal storage elevated off of the ground where moisture may collect. Also, be mindful that the containers themselves be sealed airtight and kept away from any windows or source of sunlight. If you live in an especially humid climate, outdoor storage sheds may not be the most ideal location. Look for an enclosed area that is relatively cool and dry. This is a myth that has been debunked time and time again. While you may have heard reports of fires due to the spontaneous combustion of a bag of charcoal, this is, in fact, the wrong kind of coal. House coal, a fossil fuel that many people use to heat their homes, is the only household type of coal that has been known to spontaneously combust. Spontaneous combustion is essentially heat created through pressure. For grilling charcoal to spontaneously combust, it would require you to have a pile of charcoal bigger than a barn. As much as we love grilling with charcoal, that is more than most anyone would ever keep on hand. So it is highly unlikely your charcoal will ever spontaneously combust. That is not to say you should ignore safe storage practices. Always exercise care when storing your charcoal. Keep it contained in a designated storage space and out of reach of children and animals. 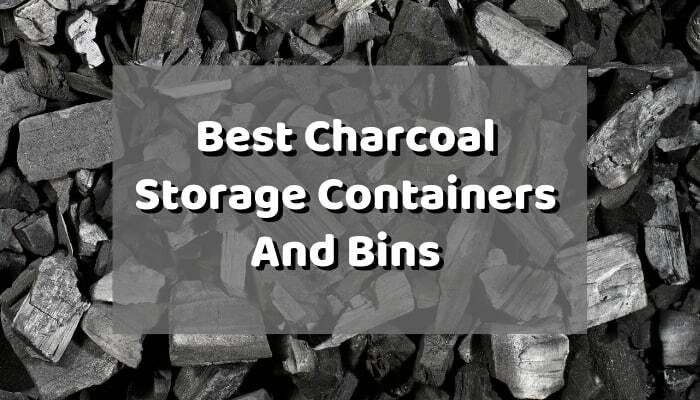 While the options for storing charcoal are vast, we hope this guide for the best charcoal storage containers has granted you some insight into what factors to consider when choosing the where and how. When summer sales begin and you stock up on your favorite charcoal, you will be ready for the long haul. Keep your charcoal stored properly, and you will be grilling all season long.